In honor of the 6 year anniversary of this blog, I am reposting the the post from year one that continues to be the most read post every year. Thank you God for your continued faithfulness to this blog-6 years running. Breaking dishes…just one or an entire kitchen’s worth; at some point all of us have been angry or frustrated to the point of wanting to throw something. Admit it. It’s true. I know I have wanted break things. Maybe it was an injustice or deep wound that kept resurfacing that brought it on. I know what you are thinking, “I can’t go around breaking dishes, I’d have to clean up the mess,” or “that’s not a proper way to deal with anger,” or “it won’t change anything.” But, in our hearts, we think it would feel good to cut loose and shatter a plate… or three. This topic came up one night with a group I facilitate for women who are victims of sexual abuse and assault. These women wanted to break some dishes! It is easy to see how these deep wounds can bring about extreme anger to the point of wanting to throw something. They didn’t just want to throw something but they wanted to see it shatter. Anger and pain had been building for years and they saw this as a way to let it out. What these courageous women really wanted was freedom, freedom from the pain, anger, and resentment that had been building rather than diminishing over time. Freedom begins by understanding what is at the core of the pain. Once we know what is at the core such as fear, shame, or unworthiness then we can declare our freedom in Christ and allow Him to enter in and set us free. 1 It is for freedom that Christ has set us free. Stand firm, then, and do not let yourselves be burdened again by a yoke of slavery (Galatians 5:1 NIV). 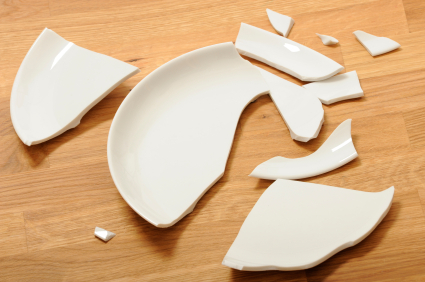 So, what would breaking dishes get us really? Freedom. Huh? Yep, that’s right, freedom. Oh we broke dishes, but with a twist. One night I surprised them with a box full of old dishes and a tarp. As we stood in front of the brick wall outside the church, I told them this was a celebration. I told them that for each plate they broke they had to declare what part of their life was now free through Christ. The shattering pieces represented what they had broken free from in their life. They shattered the enemy, shame, fear, unworthiness and so much more. When that first plate hit the wall there was an overwhelming wave of release followed by cheers and tears of joy. It was a Holy Spirit moment. Yes, it was symbolic, but God met us there as they declared their freedom and shattered their yokes to slavery. It is His desire to set us all free; free from the dirt we carry like shame and unworthiness. It is available to all of us. So, invite God to join you as you declare your freedom and go break some dishes. What does God want to release in you? What new freedom are you declaring? Share it here and breathe life and bring hope to others.